Ok so I don't know if it is related, but for the last 3 weeks, my phone has often decided it is going to be slow OR... it has a mind of its own and without any fingers, water, or other things touching it, will type on its own, select files, attempt to change the wallpaper, etc. No matter how much I mash my fingers on it to "listen," it just keeps at it! Besides doing a full factory reset (which would hopefully solve the problem), what can I do to fix my phone? Since /data is where your information is stored there's no downside to performing a Factory Reset in Recovery mode. You might as well do that and see if the phone boots properly - if it gives you some other errors it may be time to reload the firmware. If there's a Best Buy nearby you could take it in and they should be able to wipe/reload the whole thing. hi, I have the same problem of yours . And I read the replay but in wasn´t very clear to me, so, can you fix it, because I haven´t and i´m thinking that this may be don´t have a solution, except for buying a new cell phone. Thank you. Buying a new phone would be a pretty drastic solution. 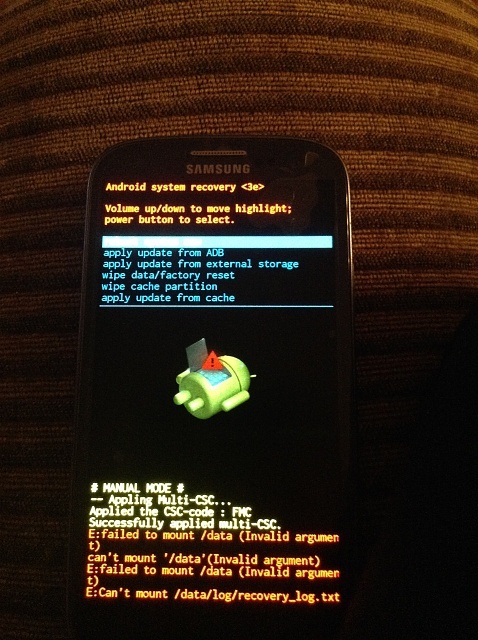 I'd suggest booting into Recovery mode and performing a Factory Reset to see if that corrects the error. I have the same problem - wiped cache partition and ever since my phone is stuck in Galaxy opening pic (whatever it's called - showing the phone model). I tried to reload my firmware using Odin (as I did several times before) but the problem hasn't been solved. I can access recovery but not the rom, and if I try to do factory reset I still get the same result - failure to mount /data. I suggestion or explanation to this problem? No explanation really - wiping the /cache partition shouldn't touch the /data partition. Unfortunately, when you use Odin to load firmware it usually doesn't touch the /data partition (assuming that you may want to keep your data intact). You could try using the Kies software to reload the firmware, or find a ROM that specifically wipes /data. I imagine that you could even use ADB to wipe/format the /data partition but I can't tell you the commands offhand. i have this same issue. tried to restore to factory setting and got that message. then tried to fix using kies to select "emergency firmware recovery" but my device won't connect to kies. it'll connect to my computer, but won't connect to kies. screen says "connecting" and my phone says "downloading.. do not turn off target" help pls? Hello, have you been able to fix your phone? I got the same error when I did a factory reset and then it got stuck on the welcome logo. I got to the system recovery screen, I did a wipe cache partition, then a factory reset and tried to reboot but it still gets stuck on the samsung logo. How do you get past that? I have backed up all the info i need so i'm not worried about losing data. I don't know anything about softwares or what odin or kies are, so a step by step solution would be much appreciated! hi! My problem is very similar to yours! I went to repair shop and they said the internal memory has a problem >< Have you managed to fix your phone?? did you try to flash stock rom with pit file in odin? I had the same problem whit my Galaxy S3. Wiped cache partition and ever since my phone is stuck in Galaxy opening pic. I did Wipe Data Cache first and Wipe Data/Facytory Reset again. I havn't any problem now. I did this.. but my phone is still stuck..
i need help on how to hard reset my tecno p5 but it showed me ":failed to mount /data" kindly need urgent help..
i dont care weather to loose personal data but i just want to restore it. After that I enter to recovery and everything works normal. My HP 10 tablet has that exact problem, except I have done a factory reset on it. I want to get it's data soon I hàva EVERYTHING on there. PLZ HELP ME!!! Galaxy S4 blutooth device paired but the app to use it cannot connect to the device.